수도권의 생활권이 확대되면서 광역교통망 체계의 정비가 날로 중요해지고 있다. 수도권의 광역교통망은 크게 지하철 및 국철, 전철을 포함하는 철도체계와 고속도로, 국도를 포함하는 도로체계로 나눠볼 수 있다. 수도권 전철망은 서울메트로와 서울도시철도공사에 관리하는 1-8호선 286.9㎞, 그 외의 한국철도공사, 인천지하철공사, (주)공항철도에서 관리하는 351.6㎞로 총 638.5㎞(2007년 기준)이다. 한편, 외곽순환고속도로를 중심으로 하는 수도권 도시고속도로망은 14개 노선 361.6㎞(2007년 기준)로 구성되어 있으며, 그 외에 서해안고속도로, 중부고속도로 및 경부, 경인고속도로등이 수도권 주요도시를 연결하고 있다. 건설교통부에서는 광역교통문제에 대처하기 위해 남북 7축, 동서 4축, 3개 순환망 간선도로망을 구축하여 2020년까지 간선도로 총연장을 860㎞에서 1,811㎞까지 확충시키려는 수도권 간선도로망 체계구축을 계획하고 있다. With the living space of the metropolitan area growing, it is increasingly important to improve the metropolitan transportation network. The transportation network is divided into the railway system including subways, national railways, electric railways, and road system including expressway and national highway. 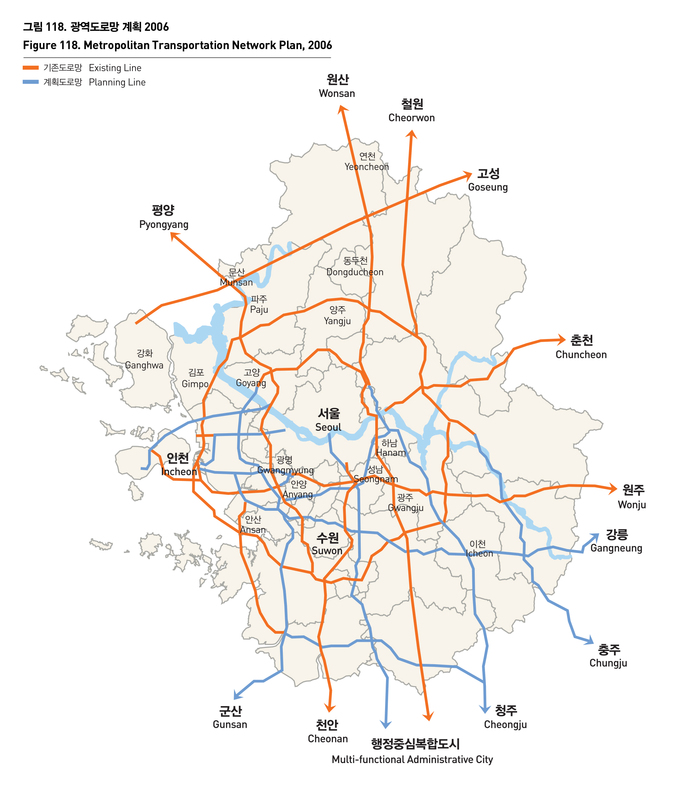 The metropolitan electronic railway network of 638.5 km is made up of subway lines 1-8 of 286.9km managed by Seoul Metro and Seoul Metropolitan Rapid Transit Corporation and railways of 351.6km managed by Korea Railroad corporation, Incheon Rapid Transit Corporation and Airport Railroad corporation(as of 2007). 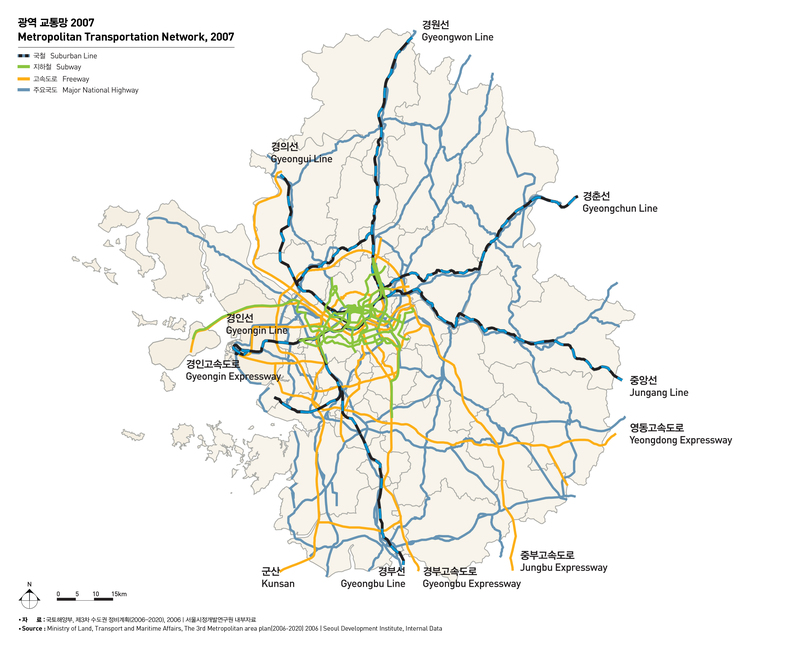 The metropolitan expressway network focusing on outer circular expressway comprises of 14 lines of 361.6km(as of 2007), and Seohaean expressway, Jungbu expressway, Gyeongin expressway and Gyeongbu expressway are connecting major cities of the metropolitan area.In an effort to deal with the metropolitan transportation problem, The Ministry of Construction and Transportation plans to extend trunk roads from 860km to 1,811km until 2020 by building 7 north-south road axes, 4 east-west road axes and 3 circular trunk roads.